THIS must have come as an embarrassment for the Union Ministry of Environment and Forests (MoEF). For five years, it has been deferring clearances for mining projects inside the Saranda forest of Jharkhand. Its contention is that since Saranda is a wildlife-rich area, a conservation zone must be demarcated before opening up more forests for mining. But in January, the chairperson of Steel Authority of India Ltd (SAIL) informed MoEF that the state government has kept all existing and planned mining leases outside the conservation zone while demarcating it. “The ministry should, therefore, grant immediate clearance to SAIL’s Durgaiburu mine lease expansion project,” he argued. The ministry’s Forest Advisory Committee (FAC) cleared SAIL’s proposal within a few days, apparently under pressure from the Cabinet Committee on Investment and the Prime Minister’s Office. But what SAIL’s chairperson told the ministry throws up awkward questions about the state government’s intention about Saranda. Spread over 80,000 hectares (ha) in West Singhbhum district, Saranda is believed to be one of the richest wildlife habitats outside any protected area in the country and forms the core of Singhbhum elephant reserve. 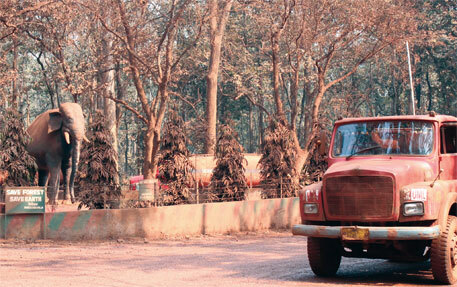 Below the sal forest lies one of the richest repositories of iron ore and manganese. About 10,000 ha has been leased to various mining companies. Though less than 2,500 ha is being mined, it has caused significant damage to the forest. “This is the reason a comprehensive wildlife management plan for Saranda was necessary,” says R K Singh, a Delhi-based conservationist who has studied the impact of mining on elephants in Saranda and has been part of FAC deliberations on Saranda. In 2009, when SAIL sought expansion of its mine, FAC asked the public sector unit and the state government to prepare an integrated wildlife management plan (IWMP) for Saranda. In the past five years, FAC, the committee that advises MoEF on forest clearance for projects, has deferred mining proposals in Saranda several times, saying their impact needs to be assessed under IWMP. Some projects that managed to obtain clearance were approved with the condition of complying with the plan once it is in place. But despite several reminders, the Jharkhand government has been buying time to submit the plan. It delayed constituting an experts committee for preparing IWMP—it was formed in August 2011, almost two years after FAC asked for the plan. The committee submitted its initial plan to the state government in March 2012. After incorporating changes recommended by the state government and MoEF, the final IWMP was submitted in April 2013, but the state government is yet to approve it. And the delay is not without reason. It appears that the prospect of creating wildlife conservation zones in Saranda and thereby putting a curb on mining has made the higher-ups in the state government jittery. Documents available with Down To Earth (DTE) show that the final IWMP is a diluted version of the draft submitted by the experts committee in March 2012. For one, the initial draft recommended declaring the undisturbed forest patches of Saranda—about 61,000 ha—as inviolate zone for wildlife conservation. The recommendation was approved by the Wildlife Institute of India, which suggested declaring the “virgin” Saranda forest as a conservation reserve under the Wildlife Protection Act, 1972. However, the conservation reserve has been reduced to 53,800 ha in the final draft to allow further mining. The dilution will benefit mining biggies, including Jindal Steel and Power Ltd (JSPL), JSW Steel, Tata Steel, Essar Steel, Sesa Goa, Arcelor Mittal, Bhushan Steel and Electrosteel Ltd (see map). “After discussions with the forest department it was observed that some areas under Saranda forest division have been further recommended by the state to MoEF...for grant of mining leases... Therefore, to avoid practical difficulty, it is proposed to exclude those areas from the proposal while declaring a conservation reserve,” reads final draft. Influence of these companies on the government is evident from the fact that in 2012 FAC deferred clearances for mining projects of JSPL and JSW for want of IWMP, but had to revoke its decision within a year. SAIL’s proposal of expanding Durgaiburu mine was deferred four times before it was given the go-ahead. FAC is currently considering preliminary clearance to Arcellor-Mittal’s mining project on 202 ha in Saranda. But FAC seems to have little idea that Arcellor Mittal’s mine lease area has been kept outside the proposed reserve. “We have heard that the state has removed all the proposed leases from the conservation reserve, but we cannot believe this till we see the plan,” a ministry official told DTE. But the Jharkhand government does not seem to be in a mood to approve even the diluted IWMP. “It is strategically delaying the plan so that all the proposed mining projects can obtain clearance from MoEF,” says D S Srivastava, member of the state board of wildlife and principle investigator of the experts committee that prepared IWMP. The list of mining leases identified by the state mining department further casts a shadow on IWMP. A list of applications of new mining leases sent by the district mining officer to the Divisional Forest Officer of Saranda in 2005, which has been accessed by DTE, shows that the mining department had recommended leasing out another 45,000 ha of Saranda to 52 mining companies. 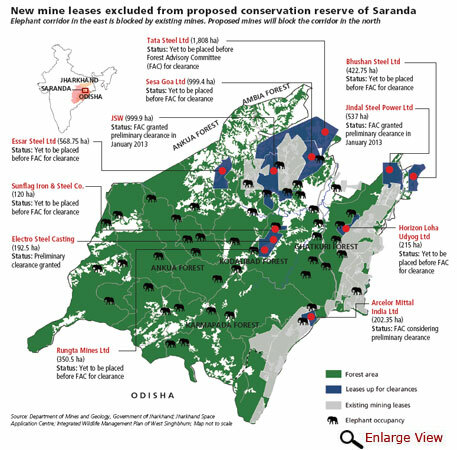 If these proposals get through, almost two-thirds of Saranda would be under mining. This will have grave consequences on the wildlife of the forest. Singh was shocked when DTE showed him that about 7,200 ha of forest has been deleted from the proposed conservation reserve in IWMP. “If what you are saying is correct, nothing will be left in Saranda for elephants. These forest compartments act as vital migratory corridors for elephants,” says Singh. The 4,000 ha of Ankua forest block that has been kept outside the conservation reserve is at the centre of Saranda and forms part of the Ankua-Ambia elephant corridor. Valleys of Ghatkuri and Karmapada blocks from where more than 2,400 ha have been excluded are prime elephant habitats. “Loss of forest cover, blasting in mines and movement of heavy machinery will force them to migrate in distress,” says Singh. Since early 2000s, when demand for iron ore soared for Beijing Olympics, mining has intensified, forcing an increasing number of elephant herds to migrate from Saranda. This has resulted in human-elephant conflicts in nearby areas of Jharkhand, Odisha and Chhattisgarh (see ‘Jumbo conflict’, Down To Earth, February 16-28, 2014). Further fragmentation of Saranda will only intensify these conflicts. Singh suggests that apart from protecting the existing mine-free area, the government should identify and protect the forest inside mine lease areas to ensure contiguity of Saranda. But instead of clearing its act, the government has entered into a blame game. “The expert committee members were not capable of making a good IWMP. They have connived with the mining companies and have given a factually incorrect report. That is why the state government is not willing to accept it,” says A K Malhotra, principal chief conservator of forests of Jharkhand. Apart from restricting mining area, IWMP seeks to regulate mining by banning night transportation, mandating iron-ore transportation through conveyor belts, closing stand-alone crushers and allowing mining leases to only those who have captive steel plants. IWMP also recommends that no further areas in the forest should be mined until existing mines are fully exhausted. It calls for a cumulative impact assessment of all mines in Saranda instead of individual environment impact assessments. Mining companies are supposed to bear the implementation cost of IWMP. Saryu Roy, former MLA of Jamshedpur (West) who had filed a public interest petition in the Jharkhand High Court against rampant mining in Saranda, blames corrupt forest officials for the political mess over Saranda’s wildlife. “The forest department is the biggest advocate of mining in Saranda. Since it has a role in sanctioning forest and environment clearances, it has vested interests in mining. This is evident from the fact that the government did not give any scientific reason for excluding the proposed mining areas from the inviolate zones in the final IWMP,” adds Roy. On March 7, MoEF informed the state government that it will not consider any new proposals for mining in Saranda until the state submits details of the existing and proposed mines and commissions a study on the water flow of rivers in Saranda. It, however, did not mention anything about the IWMP this time. The ministry’s next move would show whether it is buckling under pressure or adopting a different strategy for safeguarding Saranda’s wildlife. .Therefore, my request on behalf of Indian Citizen to the Honorable PMO, MoEF and the state Government of Jharkhand, including medias to save the Precious national gift of God for ever without any exclusion of area. The Working Iron Ore Leases also should be cancelled and no mining leases should be approved. The required Iron Ore can easily be imported like coal etc and the earning tendencies may easily be substituted by ECO-TOURISM and allied type of Forest Managemnt employing stake holders,Skill development in Soil and Water Conservation,Eco-development, bio-diversity conservation, dollar earning Tourism management like Malaysia,Indonasia, Thailand ans Singapore even by taking help of global experts . I am preparing Eco- Tourism Management Plan to be submitted within a month for needful.With regards to all concerned persons. Strands Forest in no case should be allowed to divert any of its area for non-forestry purposes except eco-tourism way of earning state revenue. It is only the previously SAL CONVERSION WORKING CIRCLE area which contains natural rage generation.Apart from several interactive natural benefits the natural gift of any mineral deposit can never be equated.So, Preserve Saranda at all cost.